Aaron Leininger's research focuses on energy recovery at wastewater treatment plants. The project will be among the first to test microbial fuel cell performance inside a working treatment plant. Students swept the best poster competition and earned first place in the presentation competition. Kjellerup's work with biofilms could help appease power needs while reducing CO2 emissions. 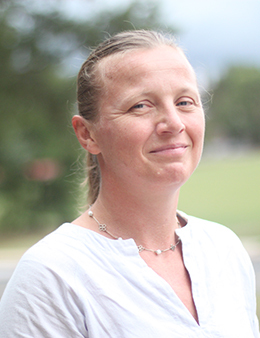 CEE Assistant Professor Birthe Kjellerup brings expertise in environmental microbiology.